Who is it for? Banjara’s Premium Rose Water is for people looking for a rose water that is a perfect blend of rose oil and rose extract, something that would revitalize the senses and make your skin glow. 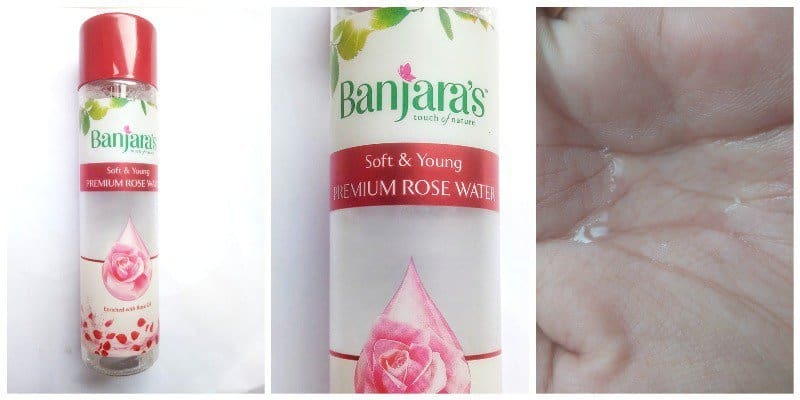 There are multiple ways of using Banjara’s Premium Rose Water. You can use it as a toner after cleansing your face properly. You can mix it with your powdered face packs to make an effective face mask paste. You can dip your cotton ball into it, and remove the dirt and grime from your face. It would also remove basic makeup, not the waterproof one. I personally use it as a facial spray; I put it in a travel size spray bottle and spray the product onto my face throughout the day. I carry it in my purse. The packaging is lightweight and since it is not a glass bottle; one can easily carry it around without the fear of leakage. To use this product, one might need to pierce the immediate top lid of the bottle. This rose water, just like any other rose water is transparent and like water. It smells like a typical rose water, it isn’t very overpowering though, which is a good sign. It’s a nice product. I can call it a nice alternative to Gulabari Rose Water. Banjara’s Rose Water is, I feel more potent because it has rose oil added to it. Whenever I use this product, I instantly feel refreshed. It hydrates my skin thoroughly without making it sticky or oily. I feel that this product would be suitable for all the skin types. I also like to use it with my powdered face packs and apply it to my face. This product is really good for removing basic makeup and can also be used to remove the dirt that settles on your face after a long hectic day. It acts as a good toner, but do not expect it to show any drastic results overnight, it won’t act on blackheads and whiteheads easily. Overall it’s a very good product, extremely soothing and refreshing, hydrates my skin perfectly, giving it a glowy look. What didn’t I like about the product? Would I recommend or repurchase? Yes, I would highly recommend and repurchase this product. It’s a good quality rose water, inexpensive and effective. There’s nothing that I don’t like about this product. Give this rose water a try, apart from the Dabur one. It is a good alternative! Bobbi Brown Long Wear Gel Eyeliner Black Ink – Worth Buying?